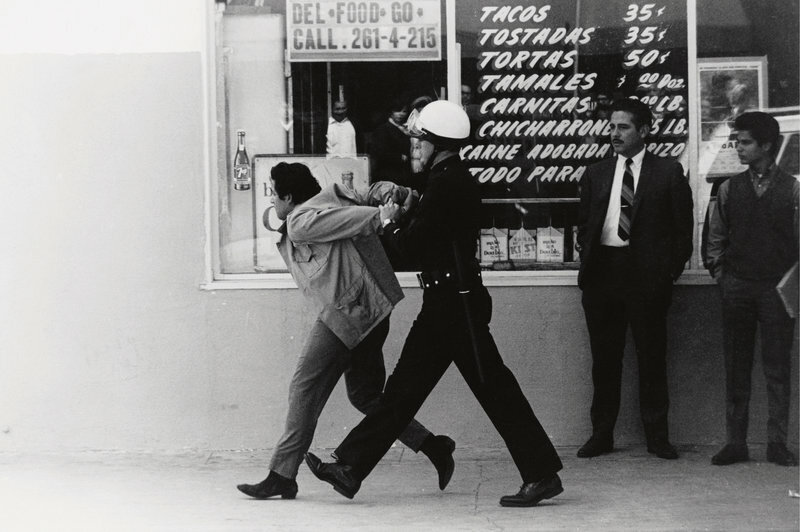 The woke police — known as “wokosos” arresting a young Chicano. Last week, multiple chapters from the 50-year-old student group MEChA (Movimiento Estudiantil Chicanx de Aztlán) voted to drop “Chicanx” from their name, arguing it has homophobic and sexist connotations. The move, which was met with fierce criticism across generational lines, also comes on the heels of a separate debate in which PC activists are trying to change the word Latino to “Latinx” in order to make it more “gender neutral” and inclusive. To outsiders, the occurrence is yet another sad commentary on the state of our culture, in which practically everything is at risk of being interpreted as sexist or homophobic. But for insiders like me, there is something profoundly more personal about it. Not because I was once a member of MEChA in the 90s (which I was), but because the debate has happened with a complete disregard for Mexican American culture and history. Because it came with an onslaught of derogatory remarks directed toward Mexicans and Chicanos. Not from alt-right racists, but from other Latinos. The trend has been bubbling at the surface for years. Nowhere have attacks on Mexican Americans been more prominent than in academia, where predominantly white liberal professors have seized on the moment to advance their own political agendas, creating rifts between Latinos over everything from skin complexion to indigenous origin—a predictable result of identity politics run amuck. To be sure, minor debates between Latinos have always existed. But the decision of multi-million-dollar universities to push divisive narratives onto Latinos like a well-oiled machine is a new phenomenon. And the more I watch it happen, the less convinced I am academia actually cares about diversity at all. On the contrary, I’ve started to believe academia’s real goal is political and ideological conformity—a strict adherence to an ever-evolving code of “woke-ness.” Step off the ideological plantation at your own risk. Admittedly, some of the vitriol has likely been brought on by Chicanos themselves who at times have acted prideful and exclusive over the years, often alienating other Latinos. I have even been guilty of this myself. But I suspect some of this hatred is also the culmination of more suppressed frustrations. After all, the United States is home to Mexican American culture everywhere you look. Top this off with ignorant Americans who think every Latino they come across hails from Mexico, and you have the perfect recipe for a lingering irritation that I can only imagine other Latinos must feel. But is this the fault of Mexican Americans, or the unavoidable byproduct of proximity? It matters. Because while younger, more progressive Latinos may hate the prevalence of Chicano culture, the fact is Mexican Americans have a long and unique history in the United States that other Latinos don’t share. Nor will they ever share. And to ignore or downplay this under the guise of “inclusivity” or political correctness amounts to erasure. You know, the same tool colonizers like to use. The truth is Mexican Americans are as American as Apple Pie. Mexicans were cowboys before cowboys. It was Mexican Americans who fought sailors in the streets of Los Angeles during the Zoot Suit Riots. It was Mexican Americans who were rounded up by the hundreds during World War 11. It was Mexican Americans who marched in the streets of Texas, Colorado, California and New Mexico during the 60s. It was the Southwestern portion of the United States that once belonged to Mexico. These events were momentous and can’t be ignored. Their remnants are all around us. And Chicanos—not “Latinos”—deserve credit for what they specifically achieved and overcame. As do all cultures and nationalities for their own achievements. But in either case, erasing or lumping everyone together with generic terms is a slap in the face to those who fought to be distinguished. Nobody is arguing Chicanos are perfect. They aren’t. But I have a hard time believing concerns can’t be expressed without tearing down what has already been built. Without disrespecting those who sacrificed everything so we could have a Chicano identity to begin with. An identity specific to Mexican American history, heritage, and struggle. An identity that masterfully weaves together both Mexican and American culture. Erasing Chicano from the American lexicon is an amateur solution that accomplishes nothing other than create more unnecessary division at a time when Latinos should be unified. What next? Ban the word “Chicano” on Twitter? Paint over all of the Chicano murals in California? I’m sure there will be plenty of alt-right racists with paint buckets ready to help. The hypocrisy is astounding. In many cases, the same PC critics who condemn Chicano culture for its machismo have no problem turning around and taking credit for its iconic art, fashion, music, and cars. Does anybody think these forms of expression resulted from cultural shame or guilt? Show me another Latino culture that has influenced American pop culture like Chicano culture and I’ll show you a Latino culture that doesn’t exist. There are 36 million Latinos of Mexican descent in the United States, and Latinos of Mexican descent represent 65 percent of all Latinos. We are, in fact, a sleeping giant. Why wake us? On the other hand, one might argue the word “Chicano” has returned to its rightful place—a word whose mere utterance has again become a self-descriptive act of rebellion against a white system who employs it to denigrate. As we used to say, now that’s firme.